Anthony Gagliardi thought he'd be throwing topwater, but the Carolina-rig proved to be a better presentation. Ticonderoga gets a lot of buzz at Champlain. 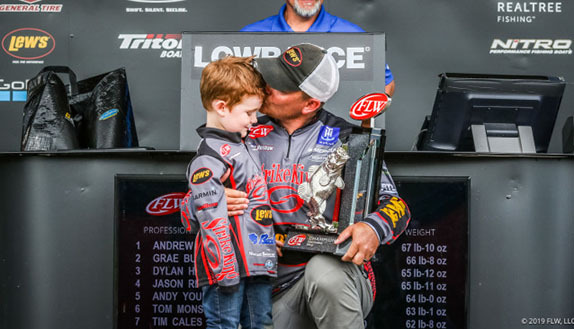 Big largemouths swim there, and it propelled Tim Horton to a dominating and memorable Bassmaster Elite Series win a few years ago. The area � site of a famous Revolutionary War fort � reared its head at last week's Champlain FLW Tour, but it petered out over the final 2 days, largely because big winds on day 2 kept Clark Wendlandt and Dave Lefebre in the north end (Kyle Mabrey and Mike Hawkes made the run). And that cold front seemed to funk out the Ticonderoga fish on day 4. Instead, north-end smallmouths and largemouths dominated this event. 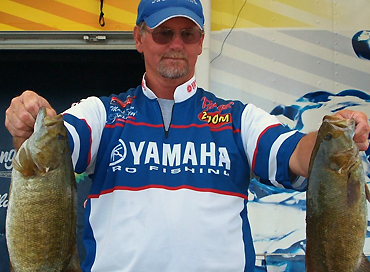 Scott Martin won with Missisquoi Bay largemouths. Here's how the rest of the Top 5 caught their fish. After his practice, Anthony Gagliardi (who fished north) figured on a topwater bite. He caught two 4-pounders the first day on a Lucky Craft Sammy, but the bite slowed and he had to scrounge around and eventually weighed two bed-fish and one dropshot fish. There was no topwater bite the second day and all his fish came on a Carolina-rig. He weighed four smallmouths and one largemouth. Day 3 was all about the Carolina-rig again. That was the windy day, with a 20 mph south blow. "There were 5-footers where I was fishing and I wasn't able to fish it," he noted. "One thing about the place was there weren't a lot of fish, but the ones that were there were big. But it wasn't a huge school. You really needed to sit still and fancast." 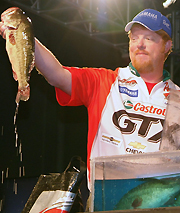 He struggled that day and weighed just four fish, which in the end was the difference between 1st and 2nd place. He did have his fifth fish on � one he estimated at about 5 pounds � but it shook off. "It was probably the biggest smallmouth I ever hooked in my life," he said. He described his area as "a flat � a grass flat. The first day the topwater fish were on isolated rockpiles. Then I moved up on the flat. It was a pretty expansive flat and each day they moved, so I had to fish around." The flat was fairly uniform at 12 to 14 feet deep with a "couple of high spots here and there." He added that the fish basically wouldn't bite a topwater in wind, and he thinks that's because the wind pushes the grass down and the fish "settle down" underneath it. > Carolina-rig gear: 7'6" heavy-action Kistler Helium 2 rod, unnamed casting reel, 14-pound Gamma Edge fluorocarbon, 3/0 Gamakatsu extra-wide-gap hook, 1/2-ounce lead weight, 4" Lake Fork Trophy Lures Baby Creature (green-pumpkin and watermelon-candy) and 3" Lake Fork Craw (same colors). > His topwater bait was a Lucky Craft Sammy 100 in ghost-brown. Main factor in his success � "Koby Kreiger. He was fishing probably 200 yards away from me. When I caught my 18 pounds (on day 1), he told me there was a big school of fish (where he was fishing). The second day, we both started on our spots, but neither one of us was doing anything. He came over and had three little ones and said he was going to go and fish some other stuff. Twenty minutes later I moved to where he was and decided to tie on a Carolina-rig to fish (his area) a little bit slower. I ended up catching some out of there, and ended up catching a lot of fish there the next 2 days. I have to give him credit." Performance edge � My Humminbird Side Imaging. You can move around those flats with it and find the rocky areas where the grass isn't so thick. It gives you a real detailed image of what the flat looks like and makes it easier to pick apart. The key area where I caught a lot of fish was where there was rock and the grass was kind of sparse. And I could see that on the Side Imaging. 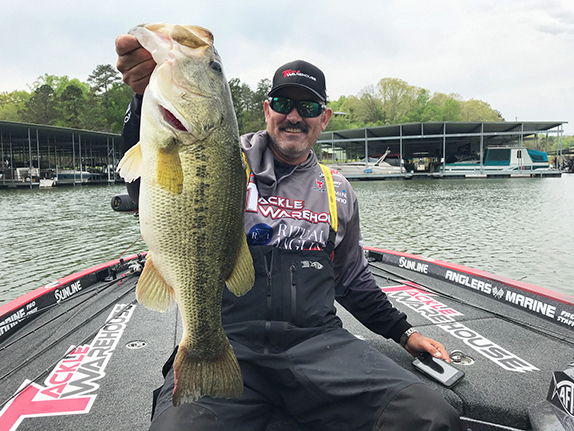 Mark Hardin worked the tip of a flat with a jerkbait and Carolina-rig. Mark Hardin led days 1 and 2 on the strength of a single smallmouth hotspot. 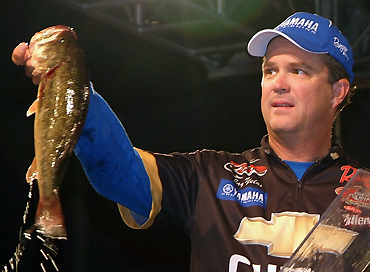 He was blown off the spot on day 3 and a 20-pound day 4 wasn't enough to overcome it. He described his spot, which was in the north end, as "a flat that runs out there, and there was a point that stuck out on the end of the flat. It was way out there � maybe 500 or 600 yards from shore. It all tapered gradually out to about 18 feet, but there was a spot where it jumped up to 15 feet on the end. That's where they were. "There was a little bit of grass on the bottom, and smaller rock," he added. "There wasn't a lot of grass there." He worked the spot with a jerkbait and Texas-rigged craw. > Jerkbait gear: 6'8" All-Star jerkbait rod, Pflueger Patriarch casting reel, 12-pound Berkley Trilene 100% fluorocarbon, Megabass 110 (Tennessee shad) and Lucky Craft Staysee 90 (handpainted blueback herring). > Texas-rig gear: 7' All Star Carolina-rig rod, same reel, 14-pound Trilene 100% fluorocarbon (12-pound leader), 3/0 Gamakatsu wide-gap hook, 3/4-ounce lead weight, Zoom Ultra Vibe Speed craw (green-pumpkin). Main factor in his success � "Being fortunate enough to find that spot. I was catching fish in a lot of different places, but those were the best quality fish I found. I didn't know in practice there were that many fish there. Lo and behold I caught that good sack the first day." Performance edge � "My GPS. I've got three different types (brands) on my boat. I'm not sponsored by any. They were units I bought over the years." 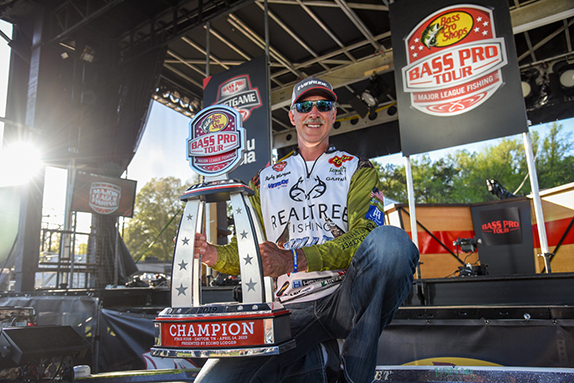 Jay Yelas says he fished Scott Martin's winning area a little bit, but couldn't figure out how to catch the big ones. Jay Yelas fished the Missisquoi and caught his fish three different ways: He pitched milfoil with a jig, fished offshore rockpiles with a big worm, and also skipped a jig around docks. The milfoil and rockpiles produced most of his fish, but he caught 5-pounder the first day and two 4-pounders later on docks. > Jig gear: 7'6" heavy-action Fenwick Techna AV Flippin' Stik, Abu Garcia Revo STX casting reel, 20-pound Trilene 100% fluorocarbon, 1/2- and 3/4-ounce weights, Berkley Gripper Jay's Flippin' jig (black/blue and Classic craw), 3" Berkley Chigger craw (black/blue and green-pumpkin). > Worm gear: 7'1" heavy-action Fenwick Techna AV rod, same reel, 15-pound Trilene 100% fluorocarbon, 5/0 straight-shank Mustad hook, 3/8-ounce tungsten weight, 10" Berkley Power worm (blue fleck). Main factor in his success � "Just having a variety of different ways to catch them in Missisquoi Bay. I didn't have one spot like Scott did. Scott fished that one spot and I fished pretty much everything else up there. He had the best spot and I had to mop up everything else. The first 2 days, I fished the same spot he did a little bit, but I never did figure out how to catch them there. I caught some small fish and just gave it to him the last 2 days." Performance edge � "All the products I was using. I only use Berkley (Pure Fishing) stuff. Last week at the Columbia River, fishing the Western (FLW) Series, I caught all my fish on Berkley stuff. This week, on the other coastline, I was catching them on Berkley stuff too. I just have total confidence in everything they make." 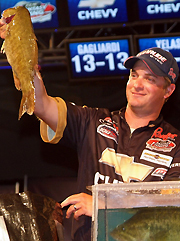 Kyle Mabrey was the only pro in the Top 5 who fished Ticonderoga. Kyle Mabrey spent all 4 days at Ticonderoga, where he cranked deep milfoil edges. "The best (edges) were when my boat was sitting in 12 to 13 feet of water," he said. "I was casting parallel to the edge and the main thing was getting it tight to the grass edge and cranking is down (the edge). A lot of fish bit when the bait first got down and out of sight � just four or five turns of the reel handle." He also added a few flip-fish. > Crankbait gear: 8' medium-action Powell CB 806 cranking rod, Abu Garcia Revo Premier casting reel, 30-pound Spiderwire Stealth braid, Bomber Fat Free Shallow (citrus shad) and Lucky Craft Big Daddy Strike (BDS) 3 (chartreuse/shad). > He flipped a black/blue Yum Vibra King tube. Main factor in his success � "Being willing to take the chance to make the long run each day down to Ticonderoga. It was relatively crowded, but the second day a lot of people who made the run and didn't catch them only went 15 miles and turned around. It was pretty rough, but I kept my boat turned southbound. So the main factor was being willing to make the long run and sacrifice fishing time and just focus on those deeper edges of grass." Performance edge � "I'd have to say the most important thing was throwing the crankbaits on braided line. I threw them in practice on 15-pound Gamma (fluorocarbon), but I wasn't able to clear the hooks. With the braid I could feel the bait and clean the hooks off. That was a big key to my success."